Have you ever had an idea or a plan only to see a friend or peer accomplish it instead? Have you ever seen someone else do something you’re good at… and they did it BETTER? How did that make you feel? What was your response? David adored our God, just like you do. He wanted to build a temple for Him, as we see in 1 Chronicles 17:1-2. Nathan, a close friend and confidant of David, agreed it needed to be done and encouraged him to begin this great and admirable work. Being qualified doesn’t make you the right person for the job. Being designated by God makes you the right person for the job. 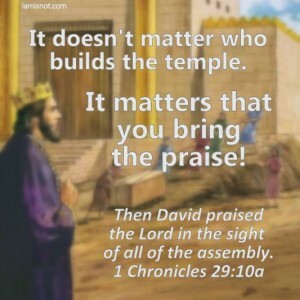 David was qualified to build the temple. Oh, who are we kidding? He was MORE than qualified. He would be the logical choice with his position, his resources, and mostly, his relationship with God. But he wasn’t called by God. In fact, God gave him a firm no. If we don’t listen to God’s assignments for us, we might take away an important assignment from someone else. Just because you can do something doesn’t mean you should. We all work together for God’s glory and we have the Holy Spirit to guide us in our decisions and in our daily walk. In her book, The Best Yes, Lysa TerKeurst emphasizes the importance of making sure we hear and do God’s assignments for us. Sometimes, that means saying no to things that aren’t for us. So, listen up and step aside. Don’t hinder God’s big picture. Our job is to praise Him, whether in the spotlight or in the background. Was David’s praise in 1 Chronicles 29:10-30 any less effective because he didn’t actually build the temple? No. And yours won’t be, either. You just listen for your assignment and God will use you for His glory. He always does. After all, it’s never been about our glory; It’s about the glory of the Assignment-Giver. This entry was posted in A Fresh Word, Get to the Point on March 19, 2015 by Missy.